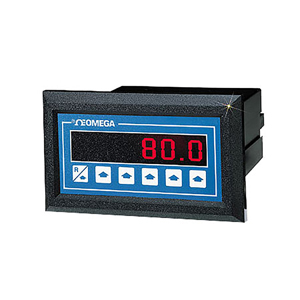 The DPF75 is a combination 6 digit totalizer/batch controller and 5 1 /2 digit ratemeter with two relays for 2-stage batch control or dual rate alarms. One relay can be set for rate alarm, if desired. The totalizer and ratemeter display in the same engineering units, the ratemeter displaying in units per second, minute, or hour. The DPF75 can accept two inputs and separately scale them for “A-B” or “A+B” with display and relay control of the net total in engineering units. Either input A rate or net total can be displayed. The DPF76 is a 6 digit scalable totalizer/batch controller ONLY with two relays for 2-stage batch control. The DPF78 is a 4 1 /2 digit scalable ratemeter ONLY with two alarm relays. The optional analog output is proportional to rate or total on the DPF75. To amplify low-level turbine and paddlewheel flow sensor inputs, order amplifier model number FLSC-AMP. The DPF70 Series is the ideal solution for many flow meter applications. Omega offers many different types of flowmeters: paddlewheels, turbines, positivie displacement, annemometers, mass flow, etc. for many application solutions. Relays: Rated 5 Amps @ 240 Vac or 28 Vdc. SPST, solder jumper selectable for N.O. or N.C., relays latch or autorecycle after 0.1 to 99.9 seconds.